What a morning! 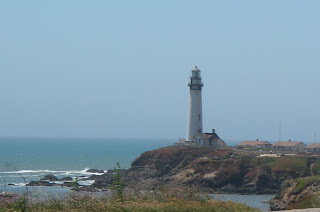 Full of sunshine and windless, we headed out of Santa Cruz and up the coast on Highway 1. The surfers were out in abundance at each of the major surf spots. We pulled off at Ano Nuevo for lunch and could hear the elephant seals barking at the beach 1/2 mile away. After lunch we faced the inevitable when traveling north along the Pacific coast, a headwind. However, we are well acquainted with headwinds in the Salinas Valley and were not overwhelmed. Then came the climbs and the road went straight up, no turns, and no moderation of the grade. When it was all over we had 11 climbs and 53.6 miles under our belts. Into Half Moon Bay we wobbled, but soon recovered after showers, super burritos and beer. Tomorrow, Devil's slide and San Francisco. So far it looks like your off to a great start! :) Love the pictures! May the sun shine all day long, everything go right and nothing wrong! Thanks Leslie, I love your little rhyme. Yesterday afternoon was hard, what with the headwind AND hills but I don't think we'll have that combo again soon after today. We'll have some hills today but overall a shorter day. Tonight we'll be in San Francisco, near Fishermans Wharf. Following your progress via blog is great! Dave, tomorrow I'll be working with Larry but will be thinking about you two (I mean three) on the road with all the adventures ahead. What a day you had. You will soon be in the beauty of the 'city'. Enjoy yourselves and the area. Really enjoy the blog process. Tomorrow I emulate your activities by riding unburdened 17 miles roundtrip to work (ok, maybe not quite the same, but out in the weather anyway). It will be chilly going down in the morning and mid-nineties coming back. What time have you been getting started in the AM? To Diana, Donna and Rob - so glad you're following us and many adventures do lie ahead. Donna and Rob thanks so much for the great stay in Santa Cruz. John - we'll feel your pain tomorrow with likely 100 degrees in Vacaville. Commuting via bike gets better every day, don't stop!